• The conference is dedicated to human resources managers and directors, tax, payroll and benefits specialists, consultants, attorneys specializing in employment and labour law, as well as CEOs and entrepreneurs. 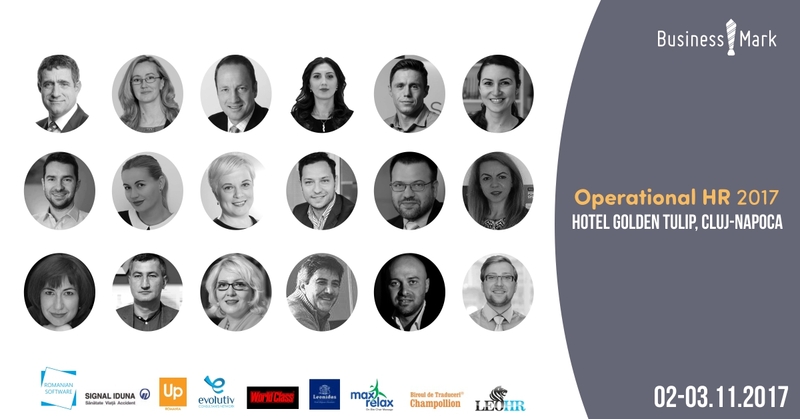 BusinessMark is pleased to announces the conference ’’Operational HR”, that will take place on the 2nd and 3rd of November at Golden Tulip Ana Dome Hotel, in Cluj-Napoca. The event brings together experienced local and international specialists who will approach topics related to organizational operations and processes. During this event, our guest speakers will discuss about reinterpreting performance standards, organizational transformation, as well as employees’ and employers’ ability to adapt in a world where change is the new certainty. The agenda includes several topical issues: the management of motivation and methods to manage performance, adjusting HR operational processes to the challenges of the local economic and social context, risk prevention, optimizing financial costs, consolidating high-performance organizations by stimulating collective intelligence, capitalizing on human capital, intelligent software versus human capital, how to retain employees in industries facing rapid change, strategic, systemic and deliberate processes that identify potential leaders, providing them with the necessary development opportunities, etc. ’’For the 2nd edition of Operational HR in Cluj-Napoca, we are pleased to be joined by specialists whose expertise is both local and international, emphasizing the human side of operations and organizational processes’’, Andreea Păun, Managaing Partner, BusinessMark, said. Our special guest for this edition is ANDRE DE WIT – Dean, LEADERSHIP ACADEMY AMSTERDAM / Vice President Learning, CARLSBERG GROUP DENMARK, whose presentation is based on the topic of The Agile Workforce – HR teams leading successful change initiatives. This edition includes a workshop that will be delivered by the representatives of Evolutiv Consultants Network, based on a SIMTALENT simulation. CRISTINA ȚIRULNIC – Senior trainer and GHEORGHE ȘTEFĂNESCU – Senior trainer are inviting participants to take over the role of managers in 5 competing companies, whose responsibility is to lead and develop their team. This practical experience will determine and support managers to leverage the potential of each team member. To register, fill out our registration form, available on BusinessMark website, and then make sure you submit it to office@business-mark.ro. The event ’’Operational HR” is organized by BusinessMark together with: ROMANIAN SOFTWARE, Signal Iduna, UP Romania, Max Relax, World Class, Ciocolaterie Leonidas Cluj, LEO HR, Evolutiv Consultants Network, AVIS, Maastricht School of Management Romania, DWNT, Cluj Cowork and Plantăm fapte bune în România. Our main radio station is KISS FM. Our conference media partners are: Signal Connect, AGERPRES, Portal HR, Ziarul Clujean, Alba Știri, inTurda.ro, Clujul de buzunar, Cluju.ro, Cluj Business, InfoOradea, NewMoney, Curierul Național, MoneyBuzz, Jurnalul de Afaceri, PRWave, AngajatorulMeu.ro, FEMEI ÎN AFACERI, Business24, Ziare.com, Manager Express, Gazetadeștiri, Săptămâna Financiară, Debizz, Global Manager, PortalManagement, Market Watch, Energynomics, Financiarul.ro, Roportal, Calendar Evenimente, PRBox, Rbeconnect, Vox Capital, Transilvania Business, Revista Valoarea, Bucuresteni.ro, MLM News, Startups.ro, Administratie.ro, MediaRabbit, Chalbert, FinZoom.ro. BusinessMark is a company that provides integrated B2B services, offering its clients complex development models, connecting them directly with the business environment, and creating opportunities for strategic partnership. Both through business event planning, and the B2B Public Relations services offered, BusinessMark aims to bring its partners communication and promotion strategies focused on business matchmaking and creating development opportunities.